This tookit, compiled by the Spiral Foundation, is designed to help adults with sensory processing difficulties better understand their diagnosis and advocate for themselves and their needs. 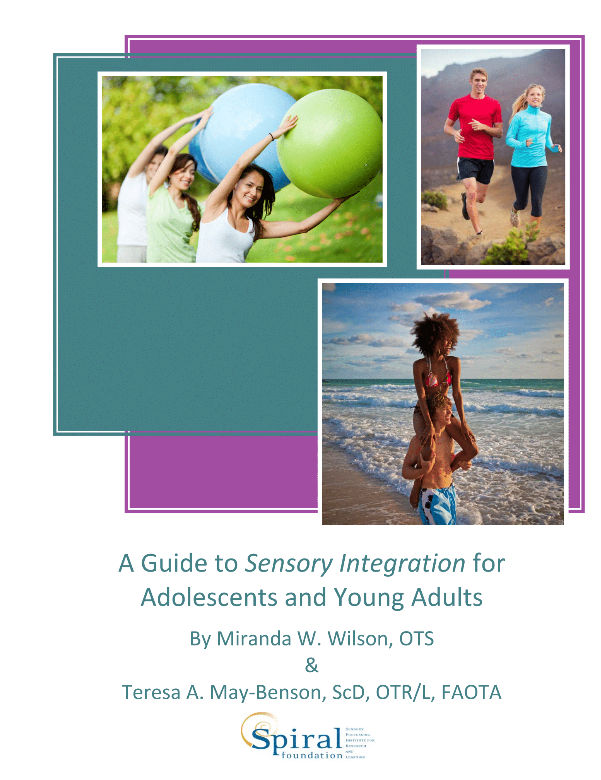 “A Guide to Sensory Integration for Adolescents and Young Adults” is a free downloadable handbook for teens and young adults who have recently been diagnosed with Sensory Processing Disorder or who suspect they may have sensory processing problems. It provides a brief introduction to the history of sensory integration, descriptions of common signs and symptoms, an overview of different types of interventions, and more. Sensory Processing Disorder, and other sensory-related dysfunctions, can present in all sorts of different ways. These ‘How Do I Know?’ checklists are tailored to adults and adolescents and offer a quick and easy way to determine if sensory integration-based therapies may be helpful for you or someone you know. They are not exhaustive and cannot, and should never, replace a proper evaluation, but they can be a good place to start if you believe you may have sensory processing difficulties. 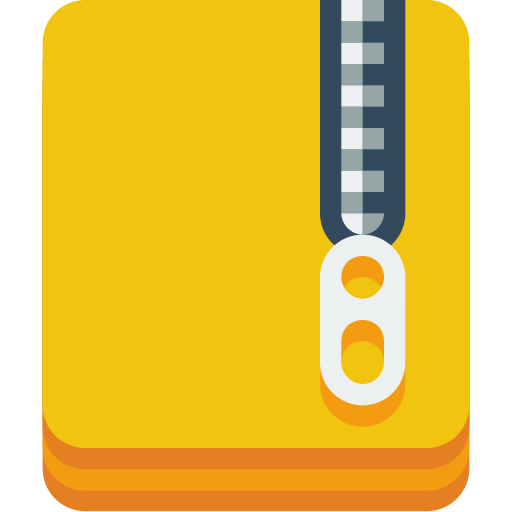 Includes checklists in the following languages: English, German, Portuguese, Russian, and Turkish. The American Occupational Therapy Association, or AOTA, has compiled information on a wide variety of topics in the form of short, printable fact sheets. The links below lead to several on topics related or of interest to adults and adolescents with sensory processing concerns. These toolkit brochures provide simple sensory regulation activities that can be done at home, school, or work. Activities are broken down by sensory system in the Adult Sensory Toolkit. The Additional Information brochure provides more details about how to do these activities as well as additional resources. A Sensory Diet is a controlled program of interaction with sensory input throughout the day, that help us to be alert and adaptable, so we are able to function to the best of our abilities in our environment. They may be developed independently or with the help of an occupational therapist, and may be used in conjunction with other programs, as a transition to or from other programs, or as a primary maintenance and accommodation program. We all have sensory activities we perform to help keep us regulated and focused. 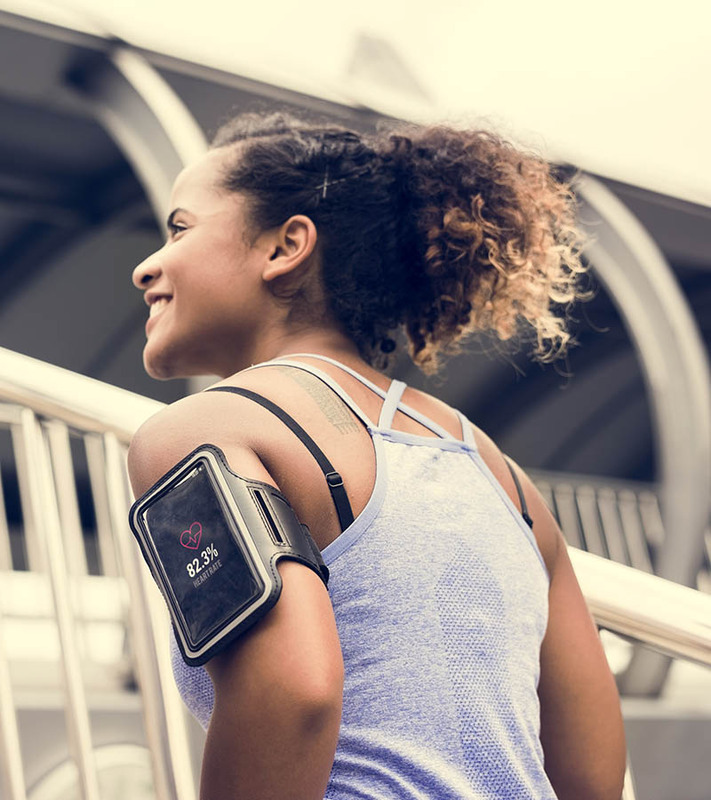 You may be able to think of a few already: drinking your morning coffee or going for your evening run. Sensory diets are just another way of structuring many of the things you already do. Download the ‘Developing Your Own Sensory Diet’ kit below for worksheets and tips on how to identify your own sensory needs and build your own sensory diet! One of the few books available on Sensory Processing Disorder and adults. A classic book by the ‘mother’ of sensory integration, updated and parent-friendly. It remains a valuable work on the subject, both practically and historically. Geared towards adolescents and teenagers. The Sensory Team Handbook takes a humorous approach in providing tips and strategies to help adolescents identify and manage their own sensory needs. 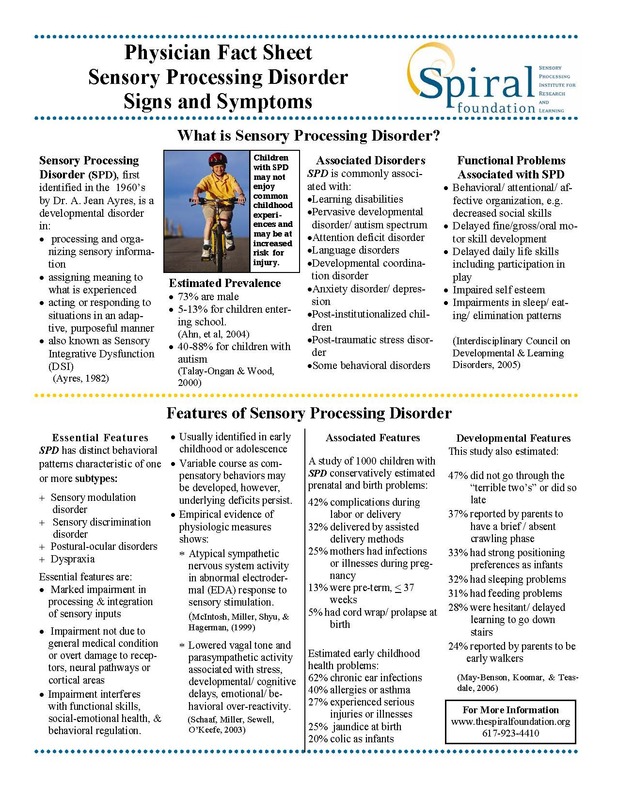 Though geared towards professionals, these two articles, originally published in OT Practice, provide and accessible introduction to the current understanding of sensory processing and Sensory Processing Disorder in adults. Both papers by Teresa May-Benson, ScD, OTR/L, FAOTA. All works on this page are licensed under an Attribution-NonCommercial-NoDerivs 3.0 Unported License.